This page is still under constuction but is pretty much complete. I’ll also be adding video’s an audio in the linked Media page. For anyone interested I have a few prototype PCB’s available. Contact me if interested. The name is a working title at the moment but will do until I think of something better. I didn’t originally intend to design this unit – It started as a modified version of a classic fuzz design to go with a x0xb0x my friends where getting as a 40th birthday pressie for another friend. The fuzz worked well but there was still a lot of empty space on my breadboard and I got to thinking ‘what if I just added…”! The result was a little box which is great as a straight fuzz and delay to go with the x0xb0x. But it’s an even better noise box! This page is meant as an introduction to the unit, giving you an idea what the controls do to allow you to explore further. The unit is made up of three parts – a fuzz circuit, a delay circuit and a modulation source for the delay. The fuzz and delay can be used independently of each other. The fuzz is pretty simple and was originally tweaked to sound nice when used with a TB-303 or modern clone. In testing it also sounded great with a thumb piano (with pre-amp) and a drum machine. The unit has been designed to work with instrument level signals, so really hot signals (such as modular) will just distort a lot and will need attenuation. Instruments such as guitars may need a pre-amp to boost the signal level before it reaches this unit. The switched controls can be quite subtle at certain settings. Adjusting the level of the signal into the fuzz will also have an effect the sound. The output of the fuzz has been normalised to the input so with nothing plugged in it will self oscillate. Bear this in mind when plugging it into your mixer! Switching the fuzz to bypass or dropping the level to nothing will stop the fuzz oscillating. The modulation section is designed to be very flexible. It can be a cycling triangle wave low frequency oscillator (LFO) with separate controls for Rise and Fall. Or it can be a linear envelope generator triggered by either the arcade button on the front or an audio signal to trigger circuit. The input to the audio to trigger circuit is normalised to the delays audio input but will respond to any other rhythmic signal plugged into the the external input including trigger pulses. If it doesn’t appear to be responding the way you think it should it could be a few things. Try tweaking the gain – if it’s up too high the signal won’t ever fall enough to turn off again. The envelope won’t re-trigger until the Rise phase has completed. This is intentional and can be useful for dividing down faster trigger signals. The signal needs dynamics (ups and downs) – percussive signals are what it’s designed for. You may notice that the signal being sent into the delay circuit can be turned on and off by the triggering circuit – something else to play with. When used with the modulation section cycling at high speeds it can be used to create signal chopping effects. The input of the delay is normalised to the output of the fuzz. You can take an output from the fuzz and delay at the same time and for this reason there are separate level controls for the dry and wet signals in the delay. 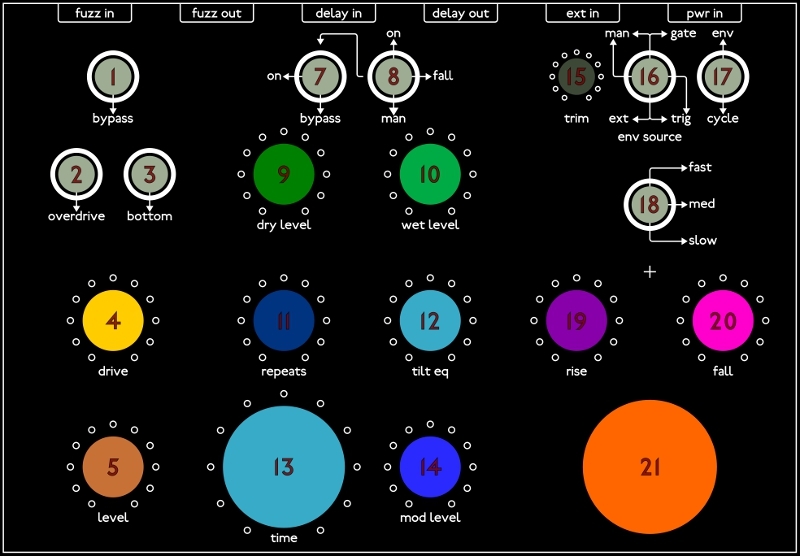 fuzz in – Instrument level input to the fuzz circuit. If nothing is plugged in this input is normalised to the fuzz out. fuzz out – Output from the fuzz circuit. delay in – Instrument level input to the delay circuit. If nothing is plugged in this input is normalised to the fuzz out. delay out – Output from the delay circuit. ext in – External signal input to trigger the envelope circuit. A trim control is provided to adjust the level of this signal. If nothing is plugged in, this input is normalised to the delay in. pwr in – 12 Volts DC input. This input is diode protected against reverse polarity. Please Note – This unit is capable of producing frequencies which could be damaging to speakers. Please take precautions such as turning down mixer levels before plugging this unit into your amplification system. bypass – Will bypass the fuzz when something is plugged in or it will stop the fuzz self oscillating when nothing is plugged in. 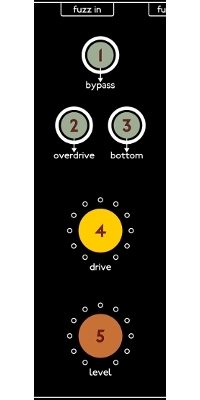 overdrive – Switches an overdrive circuit into the gain stage. bottom – Switches a boost to the bottom end into the circuit. This may not always be noticeable as it depends on the harmonic content of the circuit. Both of these switches will effect the frequency the Fuzz self oscillates at. drive – Adjusts the gain of the circuit being fed to the clipping (fuzz) stage. level – Adjusts the level coming out of the Fuzz. Up – Signal is sent to the delay dependant on the mode selected and dry signal is taken after the switch that feeds the delay circuit. Middle (on) – Signal is sent to the delay dependent on the mode selected and dry signal is taken before the switch that feeds the delay circuit. Down (bypass) – No signal is sent to the delay. Signals will still come from the delay circuit until they fade away. Up (on) – Signal sent to the delay is constant. Middle (fall) – Signal is fed to the delay in the Fall cycle of the Envelope/LFO. Down (man) – Signal is sent to the delay when the pushbutton is pressed or when the external input is high enough to trigger the envelope depending on how the env source switch is set on the modulation section. This will still be the case if the modulation circuit is in cycle mode. dry level – Adjusts the amount of dry signal sent to the output. wet level – Adjusts the amount of wet signal sent to the output. 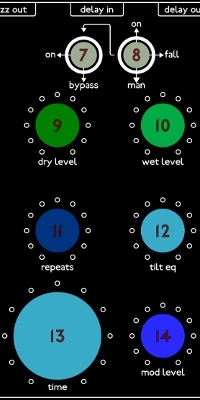 repeats – Adjusts how much of the wet signal is sent back to the input of the delay stage. tilt eq – Turned counter clockwise the low frequency is boosted and the high frequency is cut. Turned clockwise the high frequency is boosted and the low frequency is cut. As this adjust the signal level it also effects the amount of signal fed back into the delay. 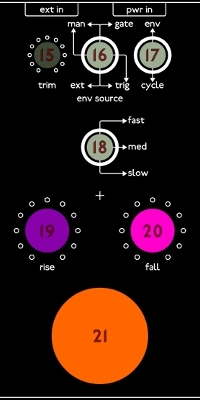 time – Adjusts the initial delay time. 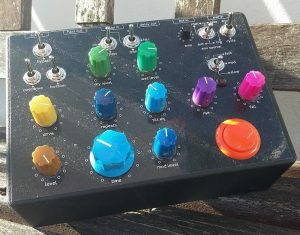 mod level – Controls the amount of modulation to the delay time. If the modulation circuit is not cycling this knob will still have an effect on the delay time. trim – Adjusts the signal gain from the external input or delay input if nothing is plugged in. The circuit will work best with signals with varying dynamics such as percussive signals. env source – Envelope trigger source. Up (man/gate) – Envelope will be triggered by the pushbutton and will be held high for as long as the button is held after the rise phase of the cycle completes. Middle (man/trig) – Envelope will be triggered by the pushbutton but will fully cycle through rise and fall even if the pushbutton remains held. Down (ext/trig) – Envelope will be triggered when external signal is high enough. It can’t retrigger during the rise phase but the envelope will retrigger during the fall phase. Up – The modulation circuit operates as an envelope generator. Down – The modulation circuit cycles as an lfo and is uneffected by the external input or push-button. range switch – Selects the cycle speed range of the modulation circuit. rise – Adjust the rise speed of the modulation circuit. fall – Adjust the fall speed of the modulation circuit. push-button – Creates an on signal which can be sent to the switch on the delay input and also trigger the envelope.